The opening of the Christmas Market on Cathedral Green next week brings the festive season one step closer, and before we know it we’ll be hearing Mariah Carey on repeat, getting excited about the John Lewis Christmas advert, and looking for the big red truck ‘coming over the hill’. 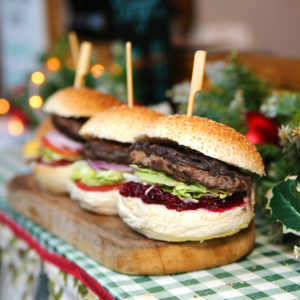 Food is one of the guilty pleasures that many people love about Christmas, and the Christmas Market has become known as one of the top seasonal picks for food lovers looking to indulge in a naughty (but very nice) Christmas treat or two. This year’s market traders are once again filling a festive Food Village to the north of the Cathedral, and there was strong competition from local and international traders. Here’s the full run-down to get whet your appetite and get your mouth watering. Exeter favourites Camper Coffee are back with their top-quality espresso drinks and some winter-warmers for the grown-ups!. Alimentos bring simple Spanish street food, specialising in traditional paella. Bison and Elk Venison Burgers from market veterans Bush Farm Catering. Frankfurter, currywurst or good old traditional bratwurst. The grill is back for the seventh year running! Gourmet Street Kitchen will be serving up the ultimate cheesy comfort food, with plenty of twists! Authentic Greek gyros from Greekook make a great finger food, and the pitta are a great challenge for a heartier appetite. Hog roasts, bacon and sausages from Kenniford Farm’s own herd of pigs, reared in Devon. Tartiflette, Roquefort mussels and garlic mushrooms will be served up by Noemie and her team from Les Plaisirs De France. C’est magnifique! Sweet or savoury. Simple or decadent. We’re planning on trying all the combinations from Pancrêpes this year. Slow-smoked out at Topsham, the Rib Shack from Good Game is flying the flag for local traders. These ribs have won awards, and will be served up with proper ‘slaw and fries. Nothing beats a proper pizza cooked fresh in a wood oven. Flaming Good Pizzas are bringing their Christmas Dinner Pizza back by popular demand. Let us know what you think. Delicious meat, your choice of sauce, and some really decadent potatoes fried in the fat. Simple. Simply Duck. These flatbread wraps and tagine pots will make you feel like you’re in Marrakesh, not Devon. Look out for the shawarma chicken and lamb kofta. If you’ve never had churros before then we’re not going to spoil it for you. Head down to Pancrêpes for a taste. Delicious and healthy veggie food: burgers, falafel and halloumi. Move over bake-off. We’ve got the Big Bakes Bakery bringing you delicious cakes, cupcakes and traybakes. When is the Christmas Market open in 2018? Exeter Cathedral Christmas Market opens on Thursday 15thNovember at 18.00 and is open daily up to and including Sunday 16th December. The market will then be dismantled to allow for final preparations to be made for the busy Christmas services on the 24thand 25thDecember, which thousands of people attend each year. What's new at the 2018 Exeter Cathedral Christmas Market? What’s new at the 2018 Exeter Cathedral Christmas Market?